This is our second of five assessments of the blends that have been released in the Tatuaje Little Monsters Series. This series consists of a sampler pack consisting of smaller vitolas of the popular Tatuaje Monster Series. The Monster Series was created by Tatuaje founder Pete Johnson as a tribute to monster and horror movies. Since 2008, around Halloween, a limited edition cigar with a different monster movie theme has been released on an annual basis as a part of the series. Each of these releases has been a new blend. Today we explore a smaller version of 2010’s “The Face” which is called “Baby Face”. The original Tatuaje Face was released in 2010 and gets its name from the Texas Chainsaw Massacre’s Leatherface. Overall, the Baby Face was a good cigar, but probably one that falls a little short when compared to the original Tatuaje Face. There are two items of note from a packaging standpoint. First up, the Little Monsters have no special coffin dress boxes (these were artistic boxes meant to resemble monster coffins that were released as a part of the original Monsters Series). All Tatuaje Little Monsters come in an orange colored cedar sampler box. Secondly, some (not all) of the boxes contain trading cards (consisting of monsters). I was a little surprised Johnson opted for this marketing angle as he already knows the frenzy that surround the Monster Series. It seems to me that the concept of including trading cards in some boxes (while a fun idea) just adds to frenzy. The original Tatuaje – The Face was the first cigar of the Monster Series to use a Mexican wrapper. For completeness, we are treating The Face and Baby Face as a single blend and include the sizes below. The Tatuaje Baby Face basically is a smaller version of the original Tatuaje Face in terms of overall appearance. The cigar is meant to represent the Leatherface character. This is demonstrated in the leathery looking wrapper. There are a few veins and some visible wrapper seams. The foot is covered and the cap appears to have something that resembles a covered pigtail (although it really isn’t one). The Tatuaje Face does not feature a paper band. Instead, a piece of jagged natural tobacco wrapper is used to create a band affect (see picture at the start of this article). 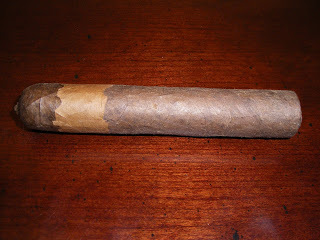 This again is tied in with the Leatherface theme Since this is a smaller vitola, there is less distance between the cap and the start of natural wrapper. The pre-light experience to the Tatuaje Baby Face is very similar to the Tatuaje Face. I opted to go with a straight cut into the Baby Face’s unique cap and commenced with a prelight draw. The dry draw notes were almost identical on the Baby Face to the original Face. It provided me notes of leather and hints of mint. This pre-light draw did not wow me, but since I don’t count the pre-light experience in the final assessment, there is no loss of points here. At this point, it was time to fire up my Tatuaje Baby Face and see what the smoking experience would bring to the table. Many of the flavor notes of the Tatuaje Baby Face were similar to what I detected on the Tatuaje Face. One difference was that the original Tatuaje Face better emphasized the flavors I had a preference for (such as more on the cocoa end). Still, the Tatuaje Baby Face does have a good flavor profile. 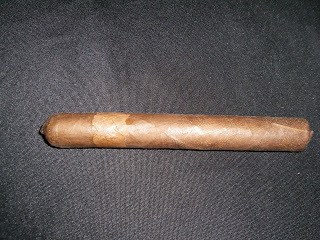 The start to the Tatuaje Baby Face continued where the pre-light draw left off as I detected notes of leather and mint. It didn’t take long before notes of cocoa and red pepper emerged. The cocoa on the Baby Face had less sweetness than the original Face and more of an earthy feel to it. In the background, I also detected some notes of grass and mint. The cocoa, leather, and pepper notes settled as the primary flavors. There were a couple of times I detected some cherry sweetness on the after-draw. This also happened in the first ten percent of the smoking experience. A pattern of the cocoa, leather, and red pepper notes would alternate as to which flavor had the edge. This continued throughout the cigar smoking experience. Around the midway point, I also detected some nut flavors. These played more of a complementary role and would complement the grass and mint notes in the background. Toward the end of the second third, all of the background notes would dissipate and left the cocoa, leather, and red pepper as the remaining flavors. In the last third the cocoa moved to the background and it was the red pepper and leather notes that would make up the flavor profile as the smoking experience of the Baby Face came to a close. The resulting nub was firm to the touch and cool in temperature. There was no harshness on the finish. Like its predecessor, the The Tatuaje Baby Face does very well with construction attributes of burn and draw. The Baby Face had a sharp burn and required minimal touch-ups throughout the smoking experience. The burn temperature was ideal. The burn rate was actually a little slow for a cigar that essentially is a petite corona. 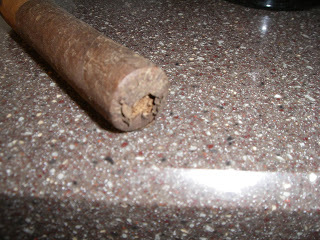 This was not a negative as it actually stretched out the cigar experience and had no adverse effects on the cigar. The resulting ash was tight with minimal flaking. The corresponding draw was outstanding from start to finish. 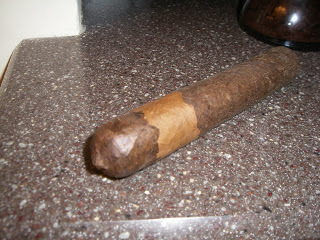 I assessed the Tatuaje Baby Face to be a classic medium-medium smoke – meaning it has medium strength and medium body. This was similar to the original Tatuaje Face except for the fact that the original Face progressed to medium to full for both the strength and body attributes. With the Baby Face, it provides the right amount of strength, however I think the Baby Face could have benefited from a boost of some more body in the flavors. Overall, both the strength and body balance each other very nicely with the Baby Face. In terms of comparing the Tatuaje Baby Face to the original Tatuaje Face, I found the original Tatuaje Face to be the better cigar experience. I believe the original Tatuaje Face had better flavors than the Baby Face. This is still a not a knock on the original Tatuaje Baby Face as this is still a good cigar. Given that this is a classic medium strength, medium-bodied cigar, I’d still recommend this to a novice enthusiast to smoke. While not as complex as the original Tatuaje Face in my book, there still is enough complexity to keep experienced cigar enthusiasts and Tatuaje enthusiasts happy. I’d also still encourage someone who hasn’t tried the original Tatuaje Face to give the Baby Face a try. In the end, the Baby Face still offers me enough to smoke this cigar again. Source: The cigars for this assessment were a part of a Little Monsters box of cigars purchased from Corona Cigar Company in Orlando, Florida.